We designed this health and wellness website with clean, white, earth tones and elements of nature, to evoke a sense of calm and serenity. 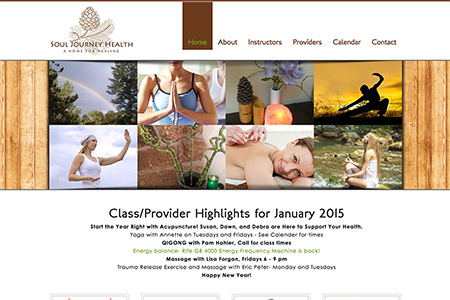 Soul Journey Health hosts a variety of classes lead by different instructors; we chose to use the home page to showcase this variety rather than focusing on a single provider. For promotional purposes, we went with a simple call to action on the home page, which highlights monthly events.